My name is Megan Moran Smith. I'm a painter inspired by color and nature. I love to see the interaction between the two. Born and raised in south Louisiana, I have enjoyed observing the beauty of the bluffs and bayous. Nature has always been an important part of my life. From a small child, I would spend my days in the woods observing mother nature or rescuing orphaned birds. Currently my studio is my backyard where birds and butterflies swoop by. This source of inspiration has a spiritual connection. My painting process begins with an awesome playlist and letting the paint fall intuitively where it wants to. Then like cloud watching, I look to see what shapes appear. This gives me direction with my painting. 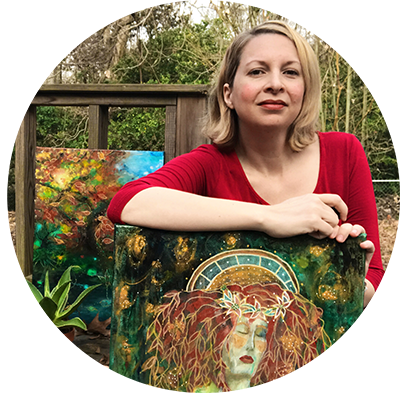 My art is described as a dreamy connection between nature and spirit. I am constantly inspired by the colors of Van Gogh’s paintings and the natural studies of John James Audubon with a splash of Frida Kahlo. I'm so glad you're here. Please look around and I feel honored to share my gift with you through fine art prints and lifestyle goods to adorn your home. If you enjoy my art, please sign up for news and coupons. Sending joy to your inbox!